My sister came over to helped me paint a wall while our other halfs went snowboarding. I cooked us a nice meal afterwards. She is quite the meat eater so to say, but actually suggested I'd make her a vegan dish she'd seen me post on Instagram earlier; yellow risotto with avocado, raisin and nuts. I make this on brown rice but abrorio rice, or any other grain would work nicely as well; bulgur, couscous, quinoa for example. It's very easy to put together! You will need : rice, vegetables of your choice, saffron, turmeric, pepper, oils, vinegar, avocado, sun dried tomatoes, raisins, nuts. Cook up rice and add broccoli in small bouquets some minutes before the rice is done. When the rice is done add chopped garlic and bellpepper (I had one yellow and one red) with a little more water and cover the pot with a lid. Close the stove but leave the pan on for a few minutes still. Add the spices, stir. Put in a coupe of spoons of olive oil and a little dash of vinegar. Let the risotto sit covered with a lid for five to ten minutes. Add chopped avocado (I used one for us two) and sun dried tomatoes in small bits just before serving. Serve with a lot of raisin and nuts on top. It's good just as it is this way but you can put in a spon of creme fraiche, tsatsiki or soygurt at the table too. 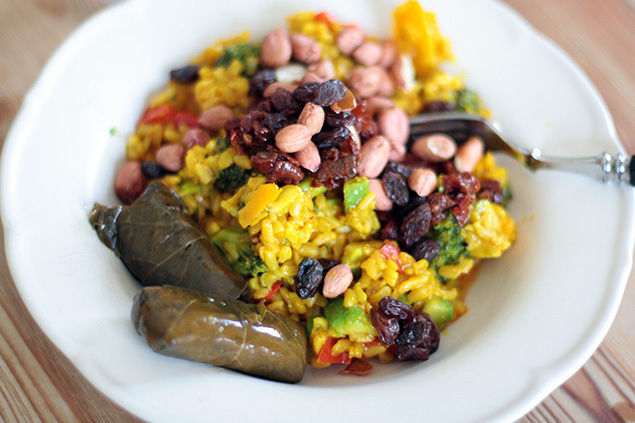 We had this with dolmadas, stuffed grape leaves, which kind of made this rather rice-on-rice heavy but then again dolmadas are so damn good not did mot really matter. For dessert I made two kinds of banana ice cream; chocolate and berry! Banana ice cream, one of my top raw sweets, is about as magic as the raw avocado chocolate mousse; hard to believe it's based on just fruit. 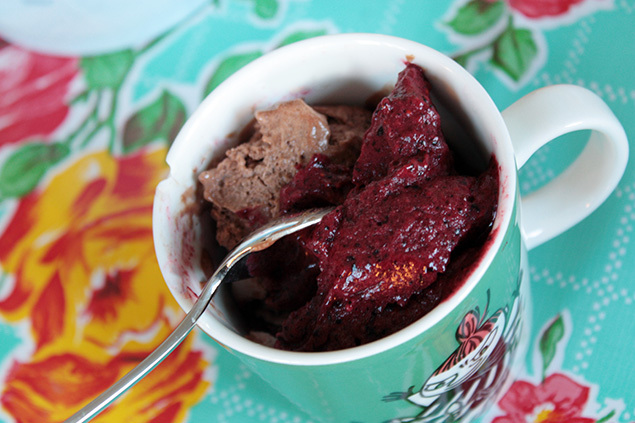 What you need for this one: bananas, cocoa powder, sweetener of your choice, frozen berries. I cut three big bananas into bits and had them in the freezer for a few hours. I mixed two of them into a fluffy paste in the mixer and added a couple of spoons of cocoa, a little real vanilla powder and about a tea spoon coconut sugar. I put the mix my ice cream maker, but placing it in a pot in the freezer for an hour or two and fluffing it up every now and then would work just as well. I mixed the third banana fluffy together with half a bag (about 100g) of frozen blue berries and half a bag of black currants. That made enough ice cream for the boys too! Love the meal idea! I want to decrease a little around the gut area as well (too poor to buy new outfits...) but have a huge sweet tooth, so I love the banana ice cream. What kind of nuts did you use in the rice meal? The food looks amazing. Will definitely try!